I went to a house that smelled like the end of the world. It was uninhabitable. The owners were staying at a relative's house. I knew the culprit was a dead animal, but despite an extensive search in the tight, hot, reeking attic, I could not find it. I finally realized that it was in the air conditioning unit in the house. I cut a hole in the unit and there found the rotting, maggot filled carcass. Even with the HEPA mask, the stench was beyond belief. 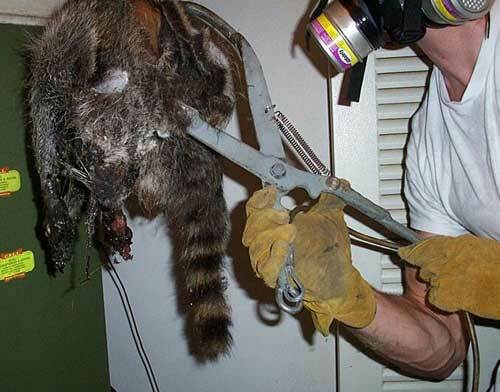 Here is the removal of the dead raccoon. It was much mushier than it looks. Here it is in a bucket. 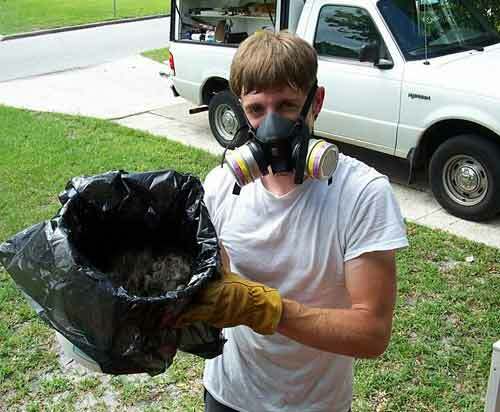 The stench soon disappeared from the house. This job was so difficult because the odor was so pervasive, and the animal was inside the air handler. The whole home smelled so incredibly bad that it was hard to pinpoint the exact area. It turns out that the reason was due to the fact that the animal was in the air handler - the unit still functioned, and actually blew the air, the horrible smelling air, through all the ducts and all the vents of the house. No wonder the smell was everywhere! It wasn't until, during my attic crawl, I noticed that the smell was unbelievably strong right over the air handler unit - even with my mask on, it was overpowering.